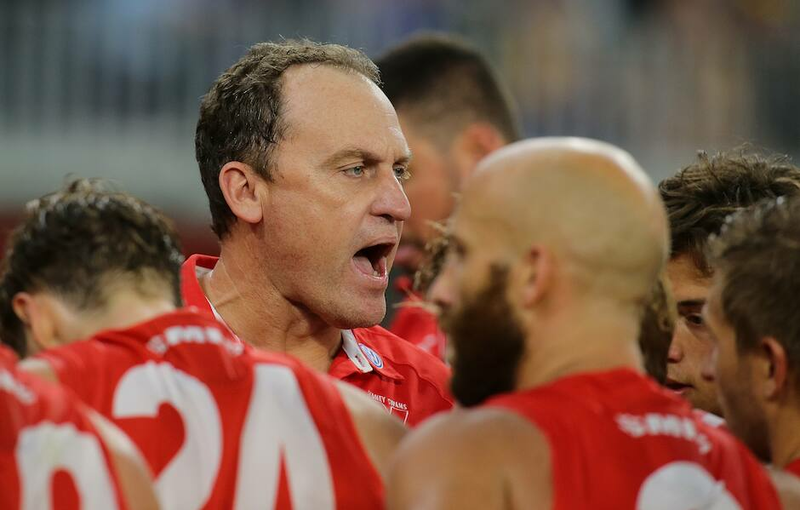 Sydney Swans coach John Longmire addresses his 22 men. Sydney Swans great Jude Bolton has hailed coach John Longmire’s tireless approach on the verge of his 200th game. Sydney’s clash with Melbourne at the SCG in Round 4 on Thursday night will see Longmire notch a double century of games, a milestone nine years in the making. Longmire has led the Swans to the finals in every one of his seasons at the helm, he steered the club to premiership glory in 2012, and he has guided his charges to three Grand Finals. Bolton was full of praise for Longmire’s unwavering dedication. “John’s consistency and longevity has been built on his relentless attitude to keep the club standards high across the board,” Bolton told Swans Media. “He has a great way with people and can build the rapport needed to get the best out of his players. Interestingly, Longmire led Sydney in his first game as coach as the Swans faced the Demons in the opening round of season 2011. Longmire, who played 200 games for North Melbourne in the years spanning 1988-1999, joined Sydney’s coaching panel ahead of season 2002. Rodney Eade was the senior coach and Longmire, Paul Roos and Steve Malaxos were assistants. After the departure of Eade following Round 12, 2002, Roos took hold of the reins and would lead the Swans until the end of season 2010 for a total of 202 games. Longmire will surpass his predecessor as Sydney meets the Brisbane Lions at the Gabba in Round 7. Eade (1996-2002) sits in third on the Swans’ all-time games-coached leaderboard on 152, while Ian Stewart (1976-1977, 1979-1981) is fourth on 111 and Charlie Pannam (1923-1928) fifth on 108. Bolton was one of the 22 Swans on the podium alongside Longmire as Sydney celebrated its 2012 premiership triumph over Hawthorn, and he says the 10-point win made for a moment to cherish. “I will always treasure the fact we were able to win the 2012 premiership and deliver a cup to the Sydney Swans supporters against a formidable opponent in Hawthorn on the MCG,” Bolton said.